The stars of L.A.’s meatiest moment also include Moo’s Craft Barbecue and asado specialist Pablo Kim. The $50 sandwich that Adam Perry Lang started serving at his new lunch-only APL Hole in the Wall takeout window in Hollywood last week is known as the Serious Barbecue Sandwich. But this colossus, whose name is a nod to Lang’s Serious Barbecue cookbook, also resembles an overstuffed New York deli sandwich. It’s packed with more than a pound of pit-cooked New York strip, which is shaved thin and served with pickle salad, sweet onions, and freshly grated horseradish. It’s a massive sandwich that’s worth its high price tag. Two or three people can share it for lunch. But it’s also leaner and easier to eat than a version of this sandwich with short rib that Lang had been R&Ding before he realized that New York strip makes more sense for a lunch that won’t weigh you down for your entire afternoon. And anyway, fans of Lang’s short rib can come for dinner at APL and order it as a shareable entrée. Plus, Lang is thinking about doing some impromptu barbecue pop-ups at Hole in the Wall. After all, he used to attract throngs of meat lovers to the Hollywood pop-ups he did at Jimmy Kimmel’s backlot, where Lang sliced short rib that’s worthy of the best barbecue joints in Texas. Lang’s $50 sandwich, available in limited quantities during lunchtime on Wednesdays through Sundays, is a Hollywood showstopper, but it’s also important to point out that you can enjoy a Hole in the Wall meal for a lot less than $50. Lang used to serve nice chili out of food carts in Midtown Manhattan, and he’s upped his chili game at Hole in the Wall, which has a $6 chili dog with chili that features hand-cut beef and New Mexico hatch chiles. Lang’s also got a $12 dry-aged chili dog where the funk of the beef is paired with ancho chiles. The $9 Hot Shot sandwich with lightly house-cured smoked beef is a play on barbecue-topped Texas toast. Everything at APL Hole in the Wall is delicious. When it comes to meat in L.A., Lang is at the top of the mountain, but he’s more than willing to share his oxygen with others attempting to reach the peak of what feels like L.A.’s meatiest moment ever. Lang’s a chef with fine-dining chops (who was part of the opening team at Daniel in New York) and he’s running a new restaurant that had an opening party where he and Kimmel welcomed luminaries like Nancy Silverton, David Chang, Roy Choi, Jake Gyllenhaal, and Mayor Eric Garcetti. But Lang is also a man who respects and befriends rising stars who are literally cooking in their own backyards. These are relationships that often start with mutual admiration on Instagram and have led to a community of meat mavens that support one another at every turn. So there was Burt Bakman of Trudy’s Underground Barbecue and the forthcoming Slab BBQ popping by APL for lunch last week, the same week when both Northern California barbecue force Matt Horn and Austin-based barbecue photographer Robert Jacob Lerma visited APL for dinner. Horn was in L.A. for his Saturday barbecue pop-up at the Original Farmers Market, where he and his wife, Juanita, quickly sold out of Texas-style short rib and where the menu also included crowd-pleasing brisket, peppery hot links, and sleeper-hit yardbird with a perfect white sauce that’s a creamy riff on Alabama white sauce. Lerma, who once invited Horn to Texas after seeing pictures of his barbecue online, was at the pop-up taking photos. Then on Sunday, Bakman, Horn, and Lerma all made their way to the Smorgasburg food market for its annual Barbecue Day, where I counted more than 100 people in line for underground sensation Moo’s Craft Barbecue at 10:45 a.m. A lot of those people endured an hour-long wait that was made more pleasant by the fact that they were eating meat from vendors like Food & Wine barbecue expert David Landsel favorites Ray’s BBQ and Ugly Drum while standing in the Moo’s line. Moo’s is a pure L.A. story. 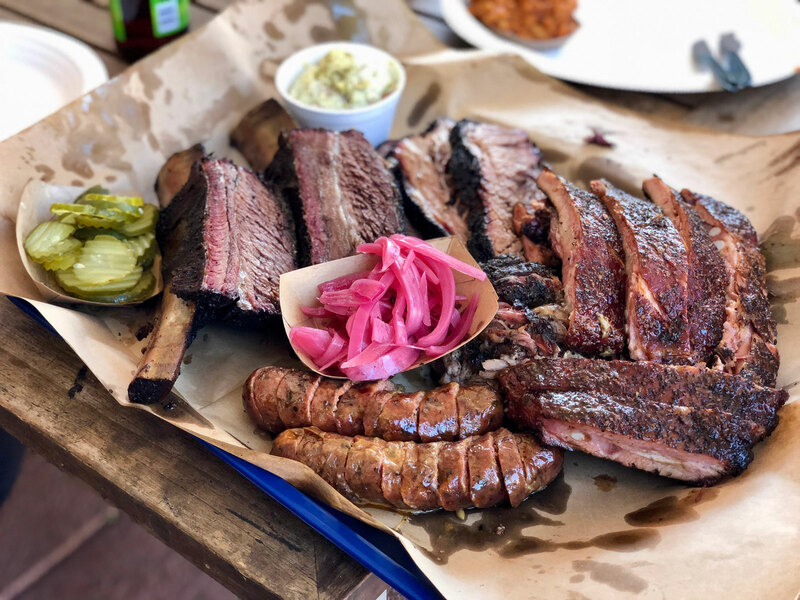 It’s run by a husband-and-wife team, Andrew and Michelle Muñoz, who have masterfully channeled the tenets of Texas barbecue in their East L.A. backyard. They’ve attracted big crowds to their home cookouts and also to pop-ups they’ve done around the city. It’s a testament to how salt, pepper, effort, and love can turn brisket into something more tantalizing than any steak. It’s a testament to how a big, meaty, supple, and gloriously fat-flecked short rib can be transcendent. Eating this barbecue with a side of esquites is a reminder that Mexican flavors and barbecue should be as tight as BFFs. 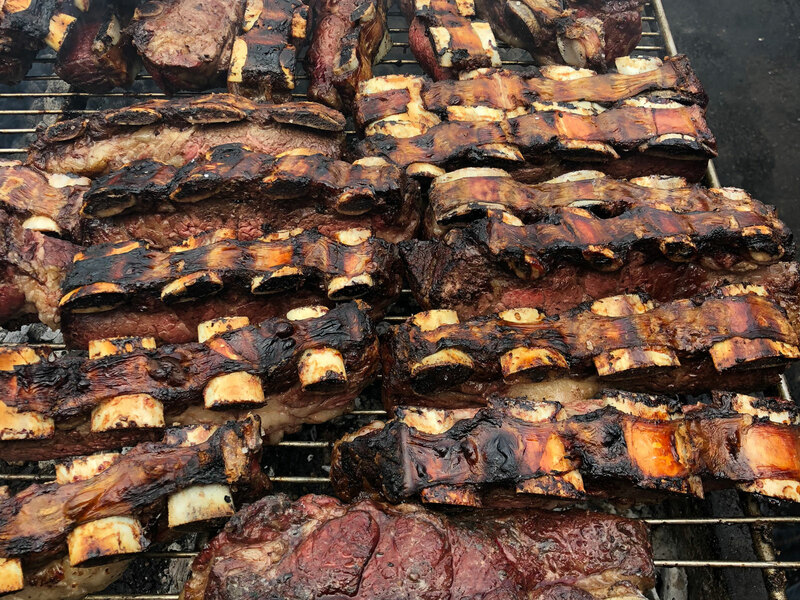 Another Smorgasburg Barbecue Day highlight was chef Pablo Kim, a MasterChef Latino season one finalist who’s giving L.A. his version of Argentinian asado. These are the type of grilled meats that you’ll find all over Argentina, in both restaurants and puerta cerradas, the “closed-door” establishments where guests pay to eat in private homes. It totally feels appropriate for Kim, who was born in Argentina to Korean immigrant parents, to be serving his short rib, chorizo, and blood sausage, with his own chimichurri sauce, at various pop-ups in L.A.
Smorgasburg, part of the growing Row DTLA complex, was visited by more than 13,000 people on Barbecue Day. That, Smorgasburg L.A. general manager Zach Brooks says, was one of the food market’s three busiest days since it opened in June 2016. Given that the day was such a success, Smorgasburg is bringing back all of the barbecue vendors this Sunday during Labor Day weekend. Beyond Moo’s, Ray’s, Ugly Drum, and Kim, the lineup includes Black Sugar Rib Company, Bartz’s BBQ, Bludso’s Bar & Cue, Highland Hickory, Pearl’s BBQ, and Stoked BBQ. L.A.’s appetite for meat in 2018 is insatiable, and the connections between people involved with so much of the meat run deep. On the exact afternoon that Bakman, Horn, and Lerma were eating Moo’s ribs at Smorgasburg, L.A. restaurant designer Kathy Delgado, whose credits include APL, was across town at Santa Monica’s Barker Hangar for the Los Angeles Food & Wine Festival. That was where Delgado ate and Instagrammed Frito pie made with wagyu chili from The Bear and Star. A couple nights earlier, The Bear and Star, a Los Olivos destination where chef John Cox showcases Texas-inspired food made with California ingredients, served smoked wagyu brisket tacos during L.A. Food & Wine. Meanwhile, one of L.A.’s best taco trucks, Guerrilla Tacos, recently went brick-and-mortar in the Arts District. At his opened-in-late-July restaurant, chef Wes Avila (who used to park his truck at Smorgasburg on many Sundays) is serving new dishes like a lamb kebab with flour tortillas, a multicultural mashup that both Smorgasburg’s Brooks and 71Above chef Vartan Agbaryan Instagrammed last week. As Agbaryan pointed out in his Instagram post, living in Glendale, where Middle Eastern flavors abound, has clearly inspired Avila. Like Lang, Avila (who trained under Alain Ducasse) has fine-dining experience and is using his considerable skills to take everyday food to new places.